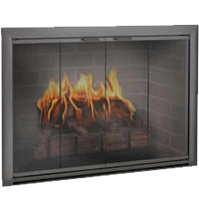 We are Connecticut’s best choice for fireplace glass doors. 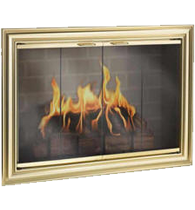 We can help your hearth sparkle as the focal point of your room. Our doors are beautiful, well built, and affordable. There are many different styles and finishes to choose from to fit your home’s unique style and aesthetics. 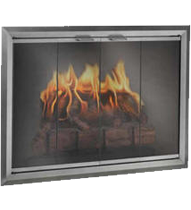 With our wide variety of styles and finishes, we can manufacture the perfect custom glass fireplace doors for our CT customers. Full-vision glass doors – We’ve eliminated the vertical metal strips to provide a clear, uninterrupted view of the fire. Custom laser-cut steel designs that allow you the optimal customized door for your home. Numerous “hand finish” options that range from the most rustic look to cutting-edge contemporary looks. Every home has a different size and style of fireplace. 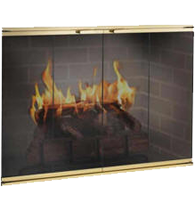 With our experience in manufacturing durable but cheap fireplace glass doors, you’ll receive a quality installation at the most competitive price. You want your fireplace to feature an elegant and appealing look. Drawing on our ability to manufacture the perfect door, we will accent the fireplace with elements incorporated into the design. 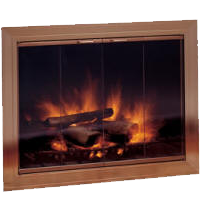 Our professional installers will measure your gas or wood burning fireplace and be sure to get a perfect fit. We service all of Connecticut. 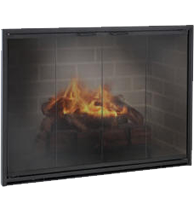 Mesh Doors – Install an extra layer of protection from sparks and keep debris out of the room. Cabinet-style mesh doors behind glass doors provide extra protection from sparks or logs that may roll forward; most doors can also have gate mesh doors instead of glass doors. 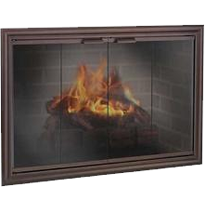 Grate Heater – Improve the efficiency of your wood-burning masonry fireplace by adding a grate heater to your door; available on all Hearth & Home and Forge Craft series doors. Glass options – All doors have the option of clear, gray, or bronze glass at no extra charge. Beveled glass – A 1” or ½” bevel along the vertical sides of the glass gives your door a little bit of extra style. 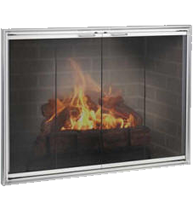 With the accessories you choose for your glass doors, our team will be able to significantly enhance the safety of your fireplace. The doors include strong barriers, eliminating sparks from entering your living room. Having doors installed will reduce the energy you’re using in the home by preventing indoor air from escaping through the chimney. 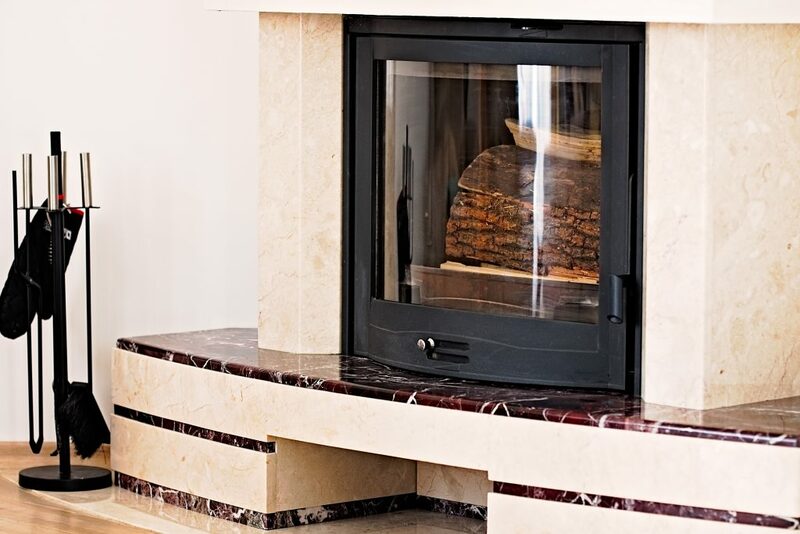 If your home doesn’t feature a fireplace, you can buy wood stoves or pellet stoves to act as your fireplace insert and add a welcoming environment to your home. That’s another reason why we’re the one-stop shop for all your masonry needs. You can choose from various options with our wide range of selections, and we’ll work with you to help find the style that best stands out in your home. Creative Masonry & Chimney also specializes in fireplace repair and building, chimney cleaning, and other masonry projects. 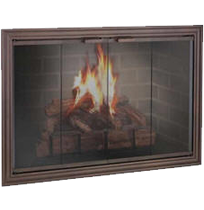 Buy from us with confidence; your custom glass fireplace doors will be measured and installed by experts!